The UK's Sea King fleet has been mothballed as private operator Bristow takes over from RAF and Royal Navy. More than 70 years of military search and rescue has come to an end in the north of Scotland as the last Sea King helicopter leaves Lossiemouth. Moray's iconic "budgie yellow" fleet has been mothballed as private operator Bristow takes over from the RAF and Royal Navy. The choppers, which were on hand during disasters including Piper Alpha and the Lockerbie bombing, have been replaced by modern Sikorsky S92s. Long-serving RAF Mountain Rescue Team member David Whalley said the Sea Kings were an "incredible" asset to Scotland's civilian rescue services. Mr Whalley said: "My first experience with the Sea Kings was in the Cairngorms when we had found two walkers who had fallen over a huge cliff. "It was amazing in wild weather and in the dark to see this huge aircraft hover there like a spaceship and take the casualties off. The thud of the Sea Kings' rotors became a noise that meant help was on hand. "The great blizzards in 1978 showed us what this incredible aircraft could do. I was at RAF Kinloss and trained with the Sea Kings. "We became an efficient team together. Many may call it the golden age of search and rescue. 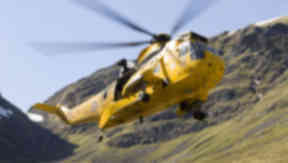 "The Sea King became an incredible asset in the mountains. It was amazing to see what this huge aircraft and its crew could do in the wildest of weather." Mr Whalley, who was awarded an MBE for services to mountain rescue, paid tribute to the RAF's work. He said: "On a wild winter’s night on Skye in 1982, we had to land on twice on the main road due to the weather conditions. "It was the same at Lockerbie, the Chinook crash at the Mull of Kintyre, the Shackelton crash on Harris and many others. "I was there when the Sea King crashed in Creag Mheaghaidh and the crew and Lochaber MRT walked away from a near-tragedy. "The crews and all who fly in them and maintain them are incredible people and I hope that what they have done is appreciated." 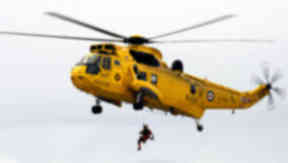 The RAF and Royal Navy have jointly carried out search and rescue operations across the UK for more than 70 years. Lossiemouth's 202 Squadron, which formed during the First World War, began flying Sea Kings out of the base in 1978. The helicopters will now be put into storage at RAF Valley in Wales, while search and rescue operations will carry on in Inverness under Bristow. Malcolm MacIntyre, who has been a member of Braemar Mountain Rescue Team for 21 years, said it was a "life-saving" service. Mr MacIntyre said: “The RAF tended to get involved in our most serious situations. If someone was out for a long time and the weather was bad or there were life-threatening injuries we would call on them for help. “We are called out around 32 times a year and in winter most of those involve a chopper. “In a helicopter they can get to Aberdeen Royal Infirmary in 20 minutes after a half-hour flight to Lochnagar from Lossiemouth. “The same journey would take four or five hours on a foot with a stretcher. I’ve no doubt that they’ve provided a life-saving service." ‣ Lossiemouth helicopters rescued 2631 people in 3348 callouts across Scotland between 2001 and 2014. ‣ The majority of alerts were medical emergencies, followed by search and rescue operations. ‣ The choppers travelled more than 207,900 miles between 2001 and 2014 - the same as flying around the world eight times. ‣ Helicopters flew 62 miles from base on an average operation - nearly the distance between Aberdeen and Dundee. ‣ Lossiemouth crews spent more than 7200 hours in the air - the equivalent of 300 days or nearly ten months. Feedback: We want your feedback on our site. If you've got questions, spotted an inaccuracy or just want to share some ideas about our news service, please email us on web@stv.tvweb@stv.tv. Updates: Would you like STV’s latest news update in your inbox every morning? Choose from our range of regular e-newsletters here.